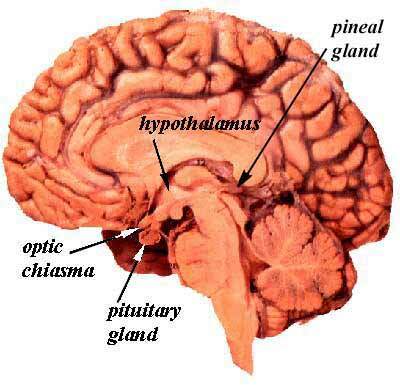 The pineal gland, a cone-shaped organ, which btw is how it got its name, is about the size of a pea and is located in a tiny cave behind and above the pituitary gland almost directly in the middle of the brain. It is attached to the third ventricle of the brain and produces the hormone "melatonin," which is secreted throughout the night with the absence of light. When light enters the retina of the eyes, this signal is sent through the optic nerve to a region of the hypothalamus called the suprachiasmatic nucleus. This pathway is called the retinohypothalamic tract. From the suprachiasmatic nucleus, nerve impulses via the sympathetic nervous system travel to the pineal gland and inhibit the production of melatonin. At night, these impulses stop (because no light stimulates the hypothalamus) and melatonin production ensues and is released into the body. As a result, it appears the pineal gland is a photosensitive organ. Or is it? Melatonin is implicated in many human activities, and perhaps human behavioral disorders. Melatonin regulates the human daily body rhythms, most notably the day and night cycle, and perhaps the depression and tiredness some people feel during long periods of overcast skies and short days during the winter months is in response to an over production of melatonin? If this is true, I wonder how melatonin production effects blind people? Are blind people more susceptible to depression because of a melatonin imbalance? Melatonin can be found throughout the animal kingdom. In reptiles and birds, the pineal gland is found close to the skin; it needs no interaction with with the eye to sense whether it is day or night. Interestingly enough, this is where the term "third eye" originated. The pineal gland is therefore the master clock for these animals. 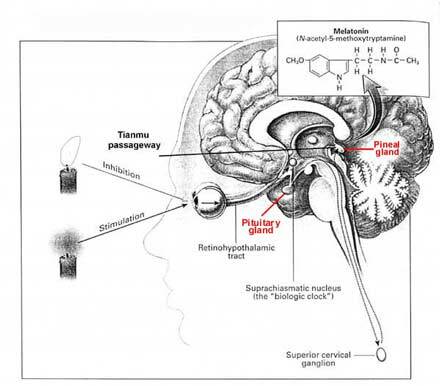 For mammals, however, the pineal gland is subordinate to the eye and the suprachiasmatic nucleus because light severely stops the production of melatonin. Medical dissection has revealed that the front section of the pineal gland is equipped with the complete structure of a human eye. Since it grows/exists inside the human skull, it has been called a vestigal eye. Conventional theory has it that the rod and cone photoreceptors in the retina are responsible for transmitting all photoreceptive input, and that the suppression of melatonin (produced by the pineal gland) is also carried out via this pathway. But, since the pineal gland is concealed in the skull, how in the world is it possible for it to respond directly to light?? Bottom line: The conventional visual pathway from the retina to the pineal gland via retinal photoreceptors or optic transduction does NOT seem to be the mode of communication. So then how does the presence of light reach the pineal gland? Talk of "unconventional photoreceptors" proposed non-rod and non-cone photoreceptors carrying non-image/non-visual optical signals. But evidence to support such a theory is absent. Another theory proposes that because the structure of the retina and pineal gland are similar, perhaps the pineal consist of a variety of genes that are only expressed in the eye; therefore, the pineal gland has photoreceptors and a complete system for optical transduction. In other words, there IS some light-communication highway to the pineal gland. But what is it?? Ah-ha! Perhaps there is a secret, "unknown" (invisible?) passageway that allows the mammalian pineal to detect light directly! "Until a few decades ago, scant attention was paid to the pineal gland. Then came the case in which a child was brought to a German clinic suffering from eye trouble and headaches. He was five-years-old and very mature, and apparently had reached the age of adolescence. Now, there has been some confusion as to what the human "Third Eye" is and where it is located. This confusion seems to stem mostly from the location of the pituitary and pineal gland and the similarity of their names. The "magical" Third Eye and the Ajna chakra have been mentioned in many religions as dwelling between the eyes, eyebrows, center of the forehead, etc., and its association with light. In the 2nd century, Galen was the first to mention the Third Eye to the West. He believed it to be a valve that regulated thought. 18th century French scientist and philosopher Rene Descartes believed it was the chief interpreter of vision and the "seat of the human soul." 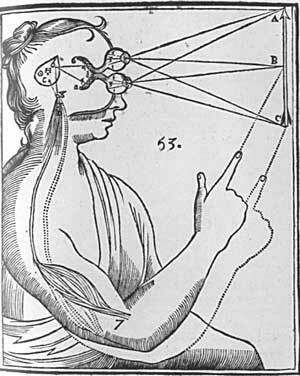 In 1644, Descartes' theory of vision and interaction with the pineal gland is expressed in this woodcut. He believed light particles interacted with the eyes and the image seen (the light particles themselves) were then transmitted to the pineal gland - the pineal gland being the nexus between the mind and the body. "In man, soul and body touch each other only at a single point, the pineal gland in the head." This drawing depicts an external stimulus being transmitted into an act of will by pointing, an act sent by the pineal gland. Now let me ask you a very interesting question: While napping or just falling asleep, have you been able to see the room you are sleeping in, or room(s) of your house/apt while your eyes have been closed?! You feel, you KNOW your eyes are closed, yet you can see as if your eyes were open!!!?? It has been said that the "Third Eye" is a direct doorway to your subconscious, or unconscious mind. This may be true. The Ancient Egyptians studied this gland and understood its paranormal power. The headdress with the cobra snake protruding from the forehead exemplifies this symbology. And it is said that the Eye of Horus and the Masonic Capstone on the top of the pyramid on the Great Seal of the U.S. dollar bill represents this understanding as well. When activated, the pineal gland opens our subconscious and 6th sense and becomes the window, or doorway to the higher planes (realms). It has been said that during the day, the pineal gland synthesizes amino acids into serotonin, which is converted into melatonin at night. The pineal gland also produces pinoline. When pinoline interacts with serotonin, we fall into the state of consciousness called the dream state. This occurs about 2 hours after going to sleep. Esoteric schools have long known that this area of the brain is the connecting link between the physical and spiritual worlds. Development of psychic abilities has always been closely associated with the pineal gland. The Crown Chakra reaches down until its vortex contacts the pineal gland. Prana is received, and with practice, the vibrational level of the astral body is raised and allowed to separate from the physical body. This is what is known as Astral Projection. Once you learn how to activate and use this wonderful "Third Eye," you will perceive higher dimensions that will astound you. In order for this to happen however, a proper relationship must be established between your pituitary gland (personality) and your soul (operating through your pineal gland ). Once this relationship is established, a magnetic field is created between the two glands, uniting the positive and negative forces to create the "light in the head." Once this "light in the head" is activated, the astral body can leave the physical body. It should be noted that you will never realize any of this until you have properly prepared yourself. This preparation takes time, effort and DESIRE. I offer many exercises that are designed simply to HELP you attain this higher level of spiritual education, so to speak, but the end result is and always will be completely up to you. For now, this is all I will say about that.